Follow the brown official Tourist Board direction signs indicated with a train symbol for ‘Pecorama Pleasure Gardens’ from the A3052 towards Beer. Weekdays from 24th July – 1st September look out for the Jurassic Mule, taking passengers from Charmouth, via Lyme Regis and Seaton along the Jurassic Coast on a vintage open-top bus. Some services will stop here at Pecorama! This service will also run over the August Bank Holiday Weekend. The X52 service travels from Exeter through to Bridport via Lyme Regis, stopping off at Beer Cross which is a 10 minute walk from Pecorama. The 9 / 9A service runs hourly from Exeter to Seaton / Lyme Regis and the 20 service travels from Taunton, via Wellington and Honiton, to Seaton where there are bus services to Beer. Both of these services are offered by Stagecoach. AVMT provide the 899 service from Sidmouth to Seaton and the 885 from Axminster to Colyton, Seaton and Beer. Some of these buses pass just outside Pecorama and will stop on request. For full details please telephone Devon Bus Service on (01392) 382800, Traveline on 0871 200 22 33 or any of the bus service providers. The nearest train station to Pecorama is Axminster, on the West of England main line. Trains run approximately every hour from Exeter St Davids and from London Waterloo. The station is approximately 9 miles from us. The 885 AVMT bus service travels from the Station to Colyton, Seaton and Beer, every hour Monday to Saturday. Alternatively, taxis from the station can be booked in advance – Axminster Taxis 01297 34000. Pecorama is located high on the hillside, less than a mile from the sea and often seems to have its own micro-climate. Therefore, if you are planning a visit and the general forecast is not that good, why not telephone us for an up-to-date report of what is actually happening here at Pecorama – the chances are we are having a lovely day! Book Day Tickets online to use between 1st April- 3rd November 2019. If you fancy coming along to one of our special events, or would like to buy an Annual or Winter Membership then you can purchase your tickets and memberships online. An email confirmation will be sent with your booking reference. Tickets and Memberships can be claimed on the day of your visit. Exhibition Only Ticket: Entry to the Model Railway Exhibition and PECO Model Shop only. Available to purchase on the door only. We always have something special going on at Pecorama! Take a look at our Special Events page for details of what’s on this year. For events that require a separate admission charge or ticket, please see the link below. 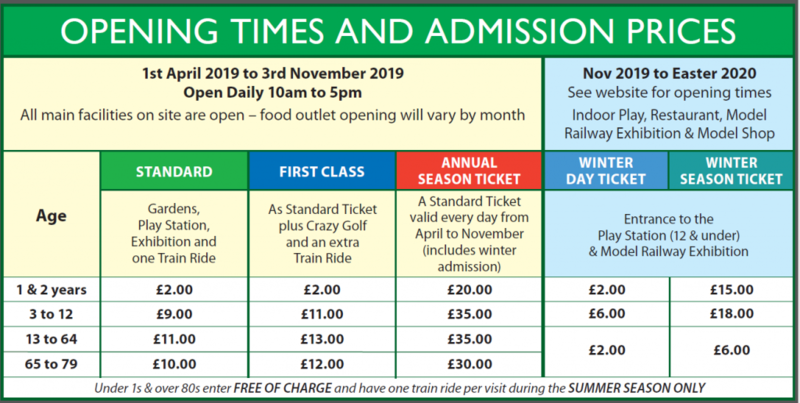 Annual Membership entitles the cardholder to unlimited entry to Pecorama for 12 months to enjoy all the facilities on offer depending on season (see Opening Times for seasonal attraction availability), including 1 train ride on the Beer Heights Light Railway, and 10% off a round of Crazy Golf! Winter Membership (valid until 1st April 2019) entitles the card holder to unlimited entry to the Play Station during the winter. Winter days and hours of opening apply. Exclusive to Members, a 10% discount is also available on shop purchases, fresh food, hot drinks and birthday party packages. Please telephone for details. Beer V.I.P. Membership (for Beer residents only) entitles the cardholder to all of the benefits of a full Annual Membership (exc. train ride and 10% off crazy golf) – these are not available online, so please contact us to purchase. We regret that no dogs are allowed within the grounds at Pecorama, with the exception of Guide Dogs and Assistance Dogs only. Disabled parking bays are located in front of the Main Ticket Office and Exhibition and within the main car park. Pecorama is situated in a hillside environment and there are steep paths within the Gardens, which cannot be negotiated alone by wheelchair users. Those with disabilities can be accompanied by one able-bodied assistant who may enter free of charge. Pecorama has a limited number of wheelchairs available for visitors to use. These are offered on a first come, first served basis. Pathways are not suitable for 3-wheeled / lightweight mobility scooters. Discounts are available for groups and special needs parties. Please contact us by phone or email for details. Please ask for assistance if required. It is exceptionally difficult for weather reporters to be 100% accurate for very specific locations. The information provided is usually fairly general, covering an area such as the West Country. What is not always understood is that the West Country is quite a narrow strip of land; with sea on both sides, north and south, and the land mass itself includes a lot of hills! 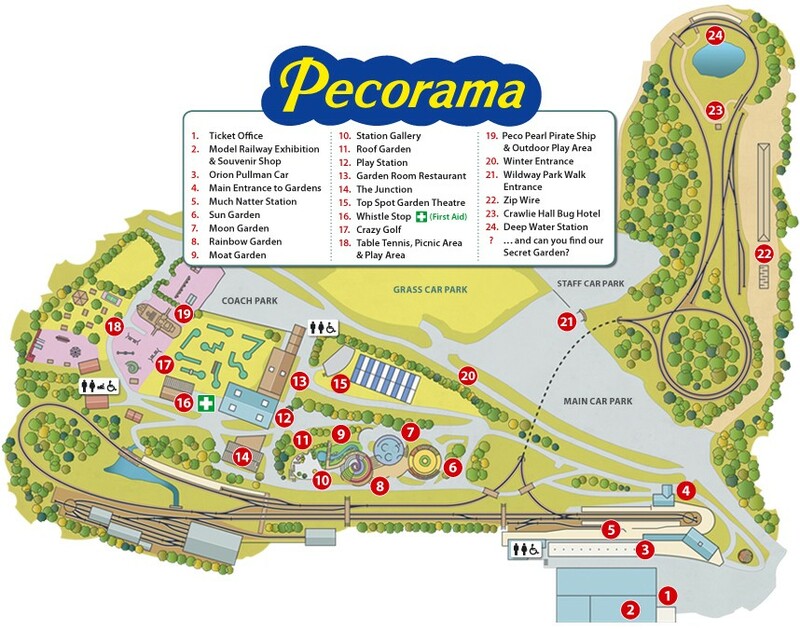 All this makes forecasting the weather accurately very difficult… Pecorama itself is located high on the hillside, less than a mile from the sea and can be susceptible to its own micro-climate! It is quite possible that if the forecast says it is raining somewhere in the West Country, the sun could be shining in Beer. If you are planning a visit and the general forecast is not that good, why not give us a call for an up-to-date report directly from Pecorama – the chances are we are having a lovely day! Even if the weather does take a turn for the worse, the Model Railway Exhibition, Play Station indoor soft play area and of course the Garden Room Restaurant, are completely under cover and so can be a useful refuge until things dry up again! The Beer Heights Light Railway often runs in wet weather when it is safe to do so and a limited number of carriages are fitted with covers (first come, first served) with the rest open to the elements! For up-to-date alerts on disruption or road closures, please click on the Directions tab in the toolbar. After a lovely day out, we know how annoying it is when you get home and realise that you left something behind. But don’t worry, we keep all lost property safe and will do our best to ensure you are reunited with your belongings. Do give us a call on 01297 21542 to reclaim your lost items. Host your special event at the Station Gallery or on the Orion Pullman Carriage! The Gallery’s versatile, triangular shaped space is ideal for exhibitions, meetings, performances, conferences and demonstrations and has recently been extensively upgraded to provide a large drop-down screen, HD projector and Wi-Fi. The Gallery can comfortably accommodate up to 60 people and is available for hire on a half day or daily basis. Hire rates are competitive and with full catering facilities, free parking and the added benefit of extra facilities including the hire of special train rides. The stunning location of the Station Gallery at Pecorama, is the ideal venue for hosting a successful event. The Orion offers intimate facilities for smaller events. An area where your guests or clients can soak up the wonderful and unique environment. Contact us to find out about our Conference and Exhibition rates. We can offer a range of group discounts and special arrangements for coach parties, school and pre-school groups, clubs and more. Driver incentives are also available. To discuss your requirements and for more information, contact us! On arrival, please pull in on the lower level to collect your tickets from the Main Ticket Office. Passengers can then either disembark at this point or remain on the vehicle and be taken up to the coach park to enter the Gardens on the higher level. The picture-postcard village of Beer nestles in Lyme Bay, on the 95 mile long Jurassic Coast, England’s first natural World Heritage Site and forms part of the South West Coastal Path. 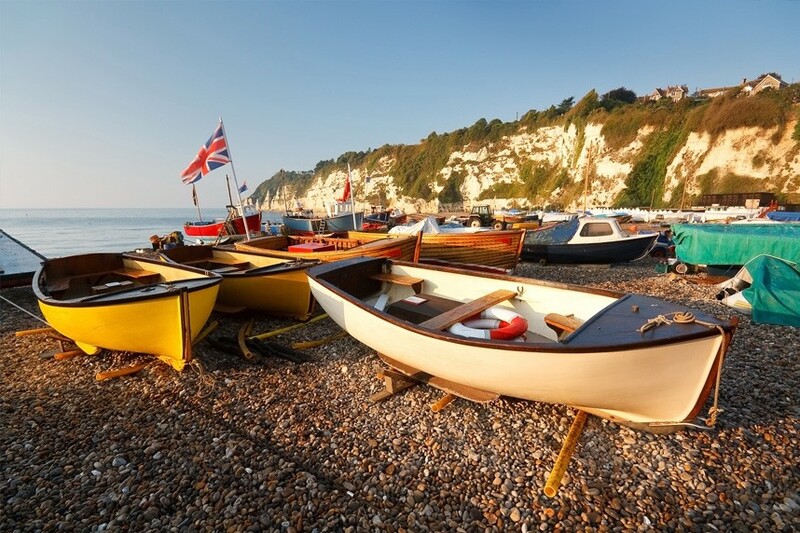 The shingle beach still boasts a small fleet of working fishing boats and the surrounding picturesque white chalk cliffs provide a natural suntrap sheltering the cove from prevailing westerly winds. Historically, the village’s main industries have always been mining for stone, fishing and farming but today the major source of income is from tourism. 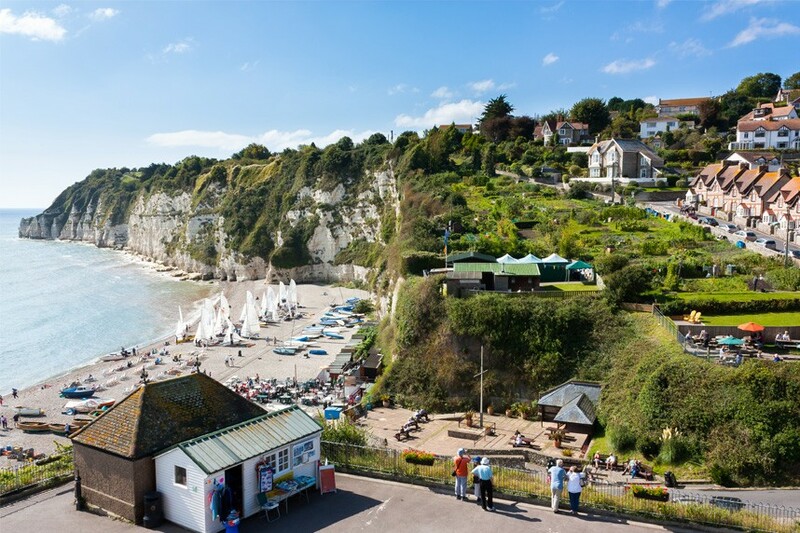 In fact Beer has been an important area for people to live for ages – first Neolithic man, then 2000 years ago the Romans, who planted vines here and quarried the limestone and then, being a sheltered seaside location, fishing soon became a way of life. The stone quarries consist of miles of underground tunnels, today known as Beer Quarry Caves, and has become a major tourist attraction. Legend has it that the famous smuggler Jack Rattenbury used to store his contraband in the tunnels and some may still be there, hidden away. Again, legend has it that the tunnels went from Beer Head all the way to Bovey House. Beer has been in the past famous for its lace work, being introduced by Flemish refugees escaping persecution between 1568 and 1577. This lace was some of the finest of its kind and a length was specially commissioned for the trimming to Queen Victoria’s wedding dress. Today, the art of lace work is kept alive by a few enthusiasts who practice the skill. The limestone was commercially quarried as it was highly prized because of its workability for carving and it can be seen in cathedrals such as Exeter, Westminster Abbey and St Paul’s. Today, there are no continuous quarry workings but occasionally a few cubes are extracted for restoration purposes. Within the chalk and limestone, seams of black flint were frequent, with the consequence that this made a very good building product when napped. Examples of this work can be found in several buildings within the village, the Dolphin Hotel possibly being one of the most impressive. Another fine example is the surrounding walls of the Moon Garden at Pecorama. During the Civil War periods it was often said that if a flintlock gun had Beer flint, it was virtually guaranteed to fire, Beer flint being one of the hardest and finest in the UK. When the opportunity arises to explore the broader locality visitors are spoilt for choice. Taking the main road out of the village eastwards you will come to Seaton and Axmouth. Although Seaton is more exposed to the elements than Beer, it has a most wonderful beach with a mile long promenade. Naturally, tourism is a very important industry to the residents. In the spring of 2016 the impressive Jurassic Coast Visitor Centre will open and definitely will be worth exploring. What is more, Seaton also has a famous Nature Reserve with several bird watching facilities, the River Axe being a natural host for many kinds of birds and small mammals. Further east there is Lyme Regis, an ancient scenic resort famous for its historic harbour, Cobb and fossiling and a landing post for the Duke of Monmouth in his famous ill-fated Rebellion. 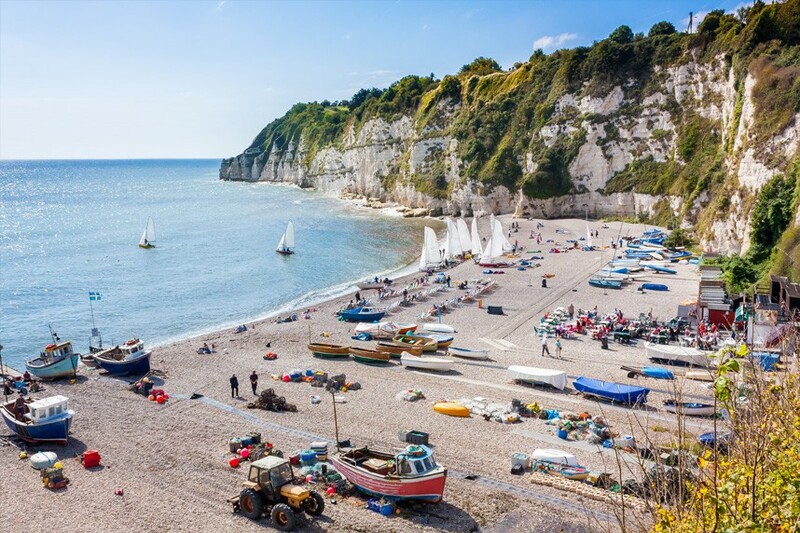 Going west you will find the majestic regency town of Sidmouth, boasting beautiful gardens, leisurely walks, fine hotels, clean beaches and friendly shops. To complete our survey, download the survey, print it and send it back to us at the address given. The draw is open to one adult visitor per group/family, purchasing a Standard or Premium Ticket, or when the gardens are closed, an Exhibition or Play Station Ticket (excluding employees of Pecorama and their families). Once drawn, the results will subsequently be published in the Railway Modeller Magazine. The Company’s decision is final, no correspondence can be entered into and there are no cash alternatives to any of the prizes. Please call our information line if you have a query, our friendly team will be happy to help. You can get in touch in a variety of ways – use our contact form below, call us or come and see us at our office reception. Home to PECO, the world's foremost manufacturer of model railway track, Pecorama is one of Devon's leading tourist attractions, set on the hillside above the picturesque fishing village of Beer. For families, garden lovers and model railway enthusiasts alike, there is something for everyone to make your day out something really special. We are proud to support CLIC Sargent and Seaton & District Hospital League of Friends in 2019. © Copyright Pecorama 2019. All rights reserved.